In 1985, at a heated auction by Christie’s of London, a 1787 Chateau Lafite Bordeaux—unearthed in a Paris cellar and supposedly owned by Thomas Jefferson—went for $156,000 to a member of the Forbes family. The discoverer of the bottle was Hardy Rodenstock, a pop-band manager turned wine collector with a knack for finding extremely old and exquisite wines. But rumors about the bottle soon arose. Why wouldn’t Rodenstock reveal the exact location where it had been found? Was it part of a smuggled Nazi hoard? Or did his reticence conceal an even darker secret? 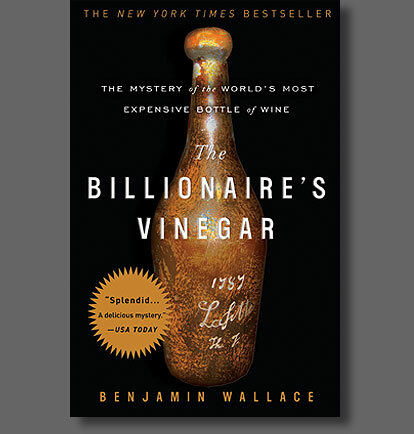 Pursuing the story from London to Zurich to Munich and beyond, Benjamin Wallace offers a mesmerizing history of wine and of Jefferson’s wine-soaked days in France. Suspenseful, witty, and thrillingly strange, this is the vintage tale of what could be the most elaborate con since the Hitler diaries.